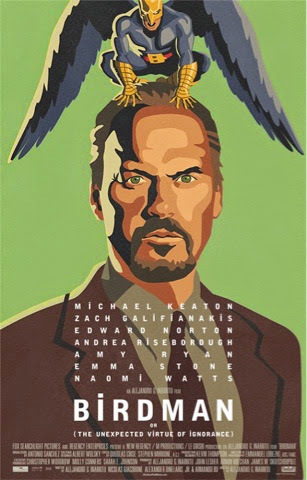 Already garnering plenty of awards buzz and nominations, Birdman is an ambitious way to kick it all off, a riotous, blackly comic look at a frustrating theatrical process. Riggan Thomson (Michael Keaton) has long been defined by his role as the superhero, Birdman, an early 90s cinematic phenomena that has haunted him ever since. Literally. In an attempt to prove his worth as an artist, he decides to write, direct and star in an adaptation of Raymond Carver's What We Talk About When We Talk About Love. He's supported by his long suffering lawyer and producer Jake (Zach Galfianakis), his daughter Sam (Emma Stone) and a cast of egocentric fellow actors (Edward Norton, Naomi Watts and Andrea Riseborough). Director Alejandro Gonzalez Inarritu cannot be faulted for the sheer ambition of his project. Edited to look like one long take, Birdman captures a sense of theatricality within its play-like construction. Scenes flow into each other, shifting and changing as characters enter and leave. The camera swirls around them, fixing on their conversations, following their frustrations and invading the grimy corridors behind the grandeur of the theatre itself. There's a rhythm to the film, kept by the pulsating percussion score that pushes the tempo of the film. Metatextually constructed with a knowing wink to a cinema-literate audience, Birdman asks some big questions in amongst the increasingly farcical backstage antics of Thomson's production. The casting of Keaton as an actor most famous for playing a superhero is the most apparent nod, as well as casting the notoriously difficult Edward Norton as a notoriously difficult method actor. From this pairing, Inarritu allows his narrative to debate art versus authenticity, theatre versus film, old school publicity versus social media and even fantasy versus reality. It's a daring exercise in organised chaos that, to Inarritu's credit, never feels as if it is about to spiral out of its director's control, even as the plot and characters become ever more frenetic. It's a delicate balance to strike, particularly given the film's one-long-take conceit, and the cast rise to the challenge that it presents. Keaton gives one of his best performances in years, making Riggan both infuriating to watch and yet entirely sympathetic. He commands the screen as both Riggan and the more comical Birdman, utilising his own Batman voice to distinguish between the two. He's matched capably by Norton as the egomanical Mike Shiner and their antagonistic chemistry also hints towards a huge amount of respect between the two actors, despite their onscreen counterparts engaging in punch-ups. It's also refreshing to see a film which offers its female stars a chance to explore flawed, neurotic characters in their own right, even within their relationships with Riggan. Stone's cynical wearniess acts as a great foil to the other, flightier characters and her deadpan delivery fits perfectly with the black humour of the film. Both Naomi Watts and Andrea Riseborough are afforded chances to shine and seize their roles with relish, even getting one of the best exchanges in the film. Even Lindsey Duncan in a small role manages to make her mark in just a couple of scenes. Many films have delved behind the scenes in a fraught theatrical process, gleefully sending up pretentious, overbearing actors or directors, neurotic writers, exasperated producers and the bizarre nature of the theatre itself. Few have done so as inventively or as memorably as Birdman. It asks big questions of its audience and doesn't necessarily offer them any right answers, or indeed a tangible conclusion to draw upon. Instead, Birdman leaves us still searching, but entirely satisfied.